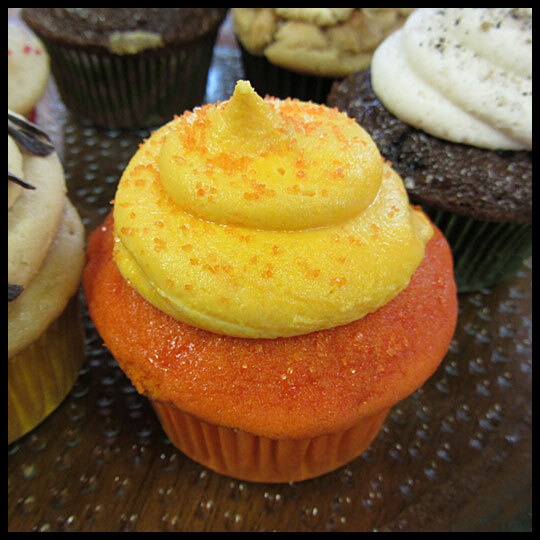 Hey Cupcake Lovers! We are so sorry we’ve been gone for so long! We haven’t stopped eating cupcakes, so we are going to do our best (at least this summer) to catch up on all the reviews we’ve been wanting to share with you. 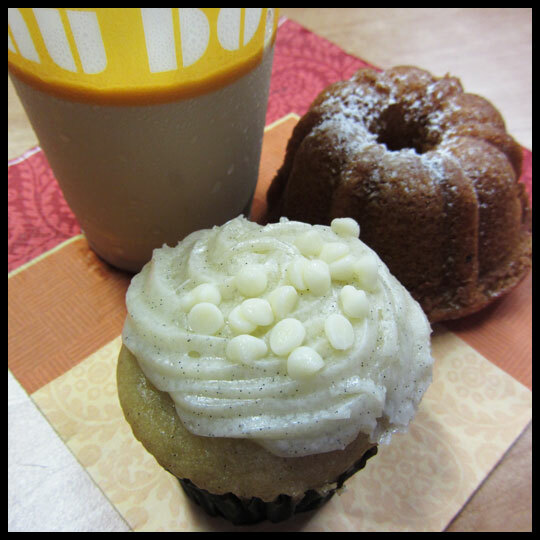 Today we are reviewing two new summer flavors that Hamilton Bakery is serving this month: Key Lime and Neapolitan. I have to admit, while I love Hamilton Bakery (they make the best scones) their cupcakes have never quite lived up to my expectations in the past. I really want to like them, but I often end up slightly disappointed, until now. 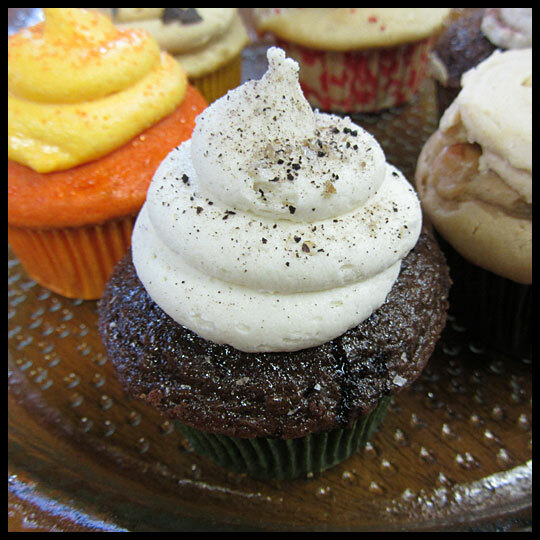 I hoped that I would eventually be pleasantly surprised, so when I saw that they were giving one free cupcake to each customer during First Friday in the Baltimore neighborhood of Hamilton, and introducing special June flavors (Butter Pecan, Neapolitan, Key Lime, and Cookies and Cream), I thought it would be a great time to give them another try. 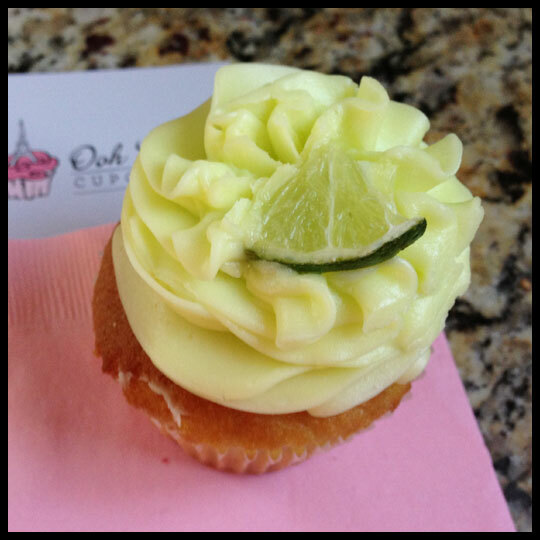 At first, I was worried that this cupcake wouldn’t have a filling (I think Key Lime cupcake should always have a filling), but to my surprise, it did! I would have liked more, but it was very tasty. The frosting had subtle lime flavor and the cake was dense but very moist. Altogether, it was a really solid cupcake and was one of my favorites from Hamilton Bakery so far. 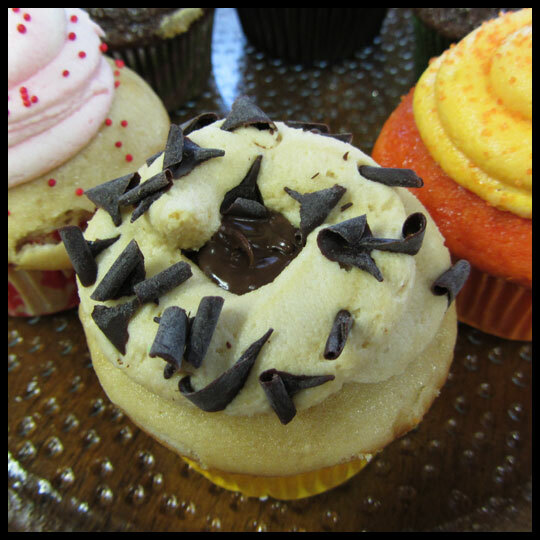 Hamilton Bakery offered two versions of this cupcake: one with vanilla cake and one with chocolate cake. I selected the cupcake with chocolate cake because the other option was topped with a large portion of milk chocolate frosting, which isn’t my favorite. However, all three frosting flavors ended up being very good. The strawberry was my favorite though, so I wish there was more of that. The last time I had a chocolate cake cupcake from Hamilton Bakery it was super dry, but not this time! These were easily some of the best cupcakes I’ve eaten from Hamilton Bakery. Finally! If you would like to try the new flavors, hurry! They’ll only be available for another week or so. 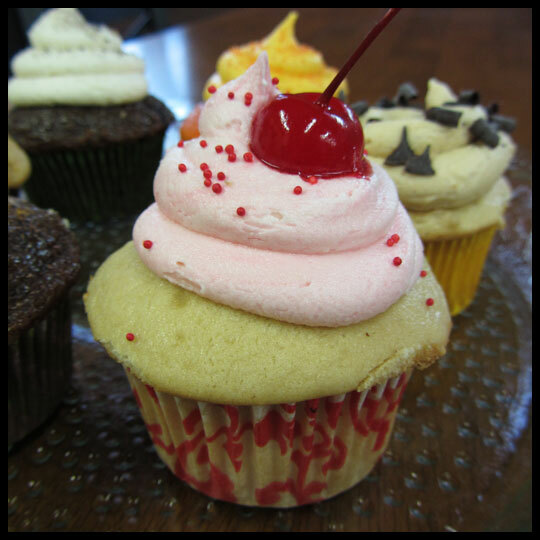 If you would rather enjoy a FREE cupcake, stop by Hamilton Bakery during their next First Friday event (check their Facebook Page for more information). Just a little heads up, you can’t take the cupcake in a to-go box, so grab a cup of coffee or tea, and stay a little while. Every summer the main street community of Hamilton organizes the Hamilton Street Festival. I have to be completely honest and say it’s definitely NOT the best street festival in Baltimore. Even though this year’s flyer design was pretty good, it’s not even half as awesome as the Fell’s Point Fun Festival or HonFest (but really, nothing is a cool as HonFest). My husband and I live within easy walking distance of Harford Rd, where the festival takes place, so this year we decided to explore the vendors’ tents and grab some lunch. As we were walking around (which only took about ten minutes… totally not exaggerating), I noticed quite a few places selling cupcakes. Only one place had cupcakes that really drew me in though, Sweet Dukes Vegan Bakery. I really want to love vegan desserts. I already don’t eat red meat or pork, so if there’s any way I can limit the amount of animal bi-products I consume, I’m totally down for that. I was also excited because they are organic and have gluten-free options. 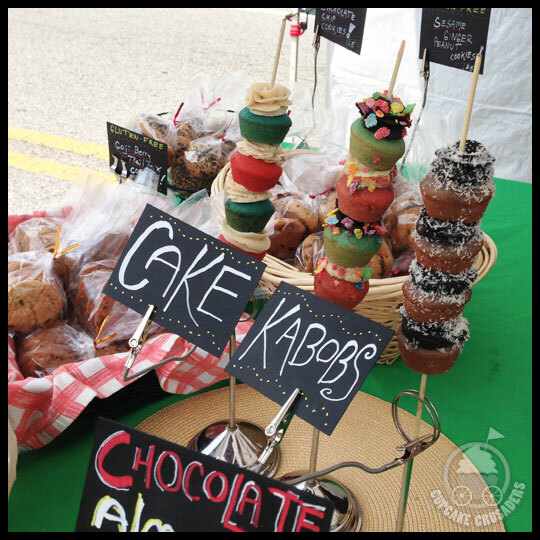 Their table was really colorful with hand written signs (which I love), fun flavor names and a big variety of cookies, cakes, and pastries, including the cake kabobs pictured above. 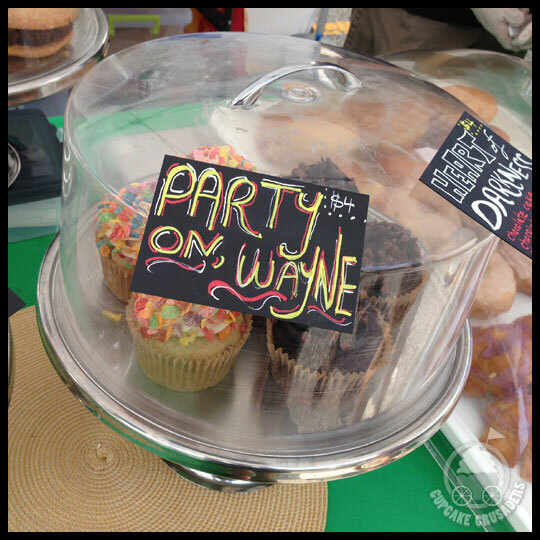 After seeing the the cake kabobs and their Party on Wayne cupcake (made with Fruity Pebbles, which apparently are considered vegan… still horrible for you, but vegan nonetheless), I was complete baffled as to what I wanted to get. I knew I’d be eating cupcakes the next day, so I was determined to limit my choice to one item. After tell the very nice people helping me that I was taking it home for later, they recommended the cupcake because the cake kabob works better if you are going to eat it immediately. I really loved how colorful this cupcake was, but unfortunately my first bite wasn’t stellar. 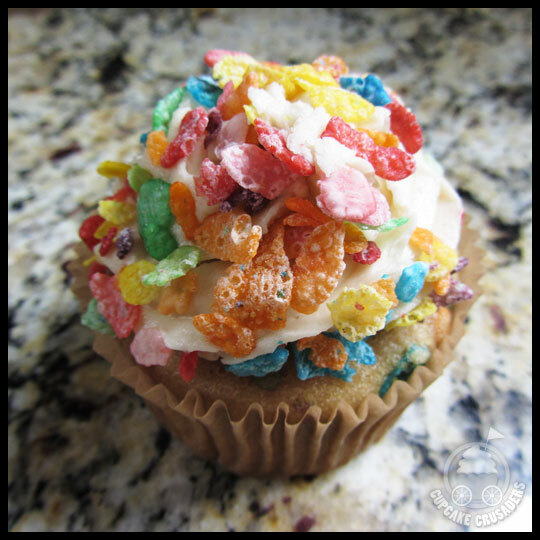 The Fruity Pebbles on top of the frosting were a bit squishy and that grossed me out a little bit. I’m guessing this was either because of the moisture from the cake and frosting, or the intense humidity from the day, probably a combination of the two. Luckily it wasn’t too noticeable in the cake though. After pushing the cereal sitting on top of the frosting aside (sad face… I was really looking forward them), I was able to examine the rest of the cupcake for what it really was: a decent vegan treat. I can’t say that it was as good as its non-vegan counterparts, but definitely better than some of the other vegan varieties we’ve tried. The cake was a bit dense, but still moist with decent flavor. The frosting was a little gritty but had a good flavor that wasn’t too sweet and didn’t taste like a butter substitute—I was boggled by this, in a good way. 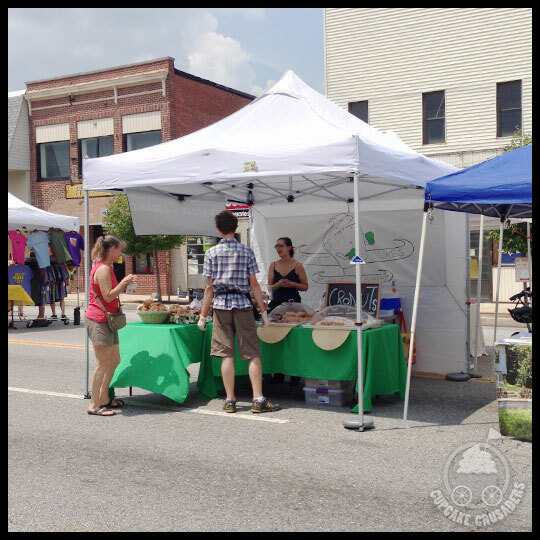 If you would like to try Sweet Dukes Vegan Bakery, you can find them at the Fell’s Point Farmers Market on Saturdays, the Fleet Street Market, or the Grind House Juice Bar. You can also follow their Facebook page to stay up to date on their latest flavors and where you can find them. We’ve all been there… You’re hungry. You’re craving something sweet. And there, sitting in front of you, is a cupcake. 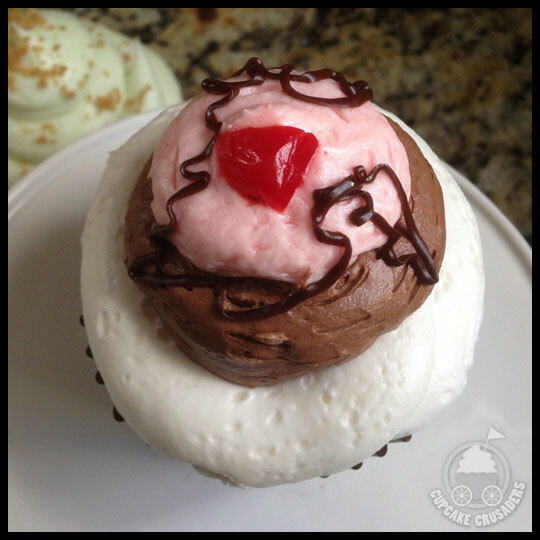 It’s really not a great looking cupcake. You know you’ll probably be disappointed. But it is a cupcake nonetheless. And you’re hungry. 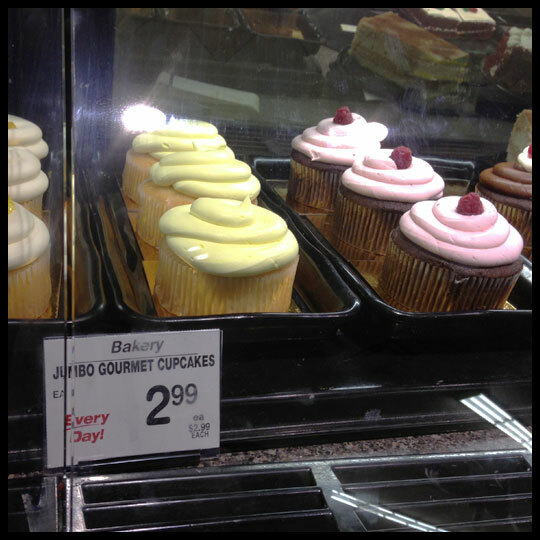 So you give in and buy the sketchy looking cupcake. This has happened to me on multiple occasions. If it hasn’t happened to you, then well done. You have way more self control than I do. 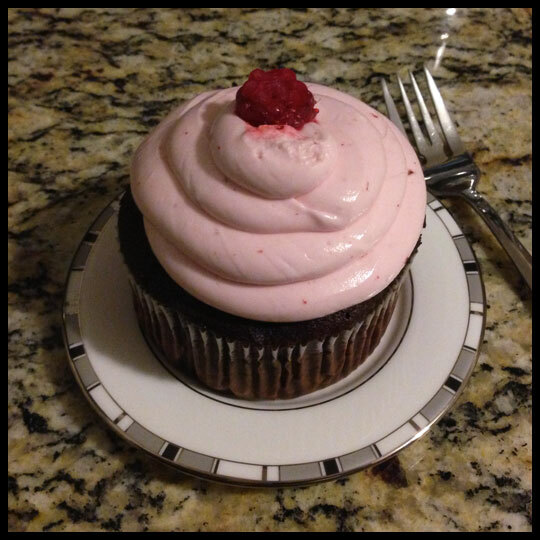 Not only was I curious about how these new gigantic cupcakes tasted, but I was in desperate need of a cupcake (don’t judge… I know you’ve been there too…) I was torn between a couple flavors, but went with my go-to comfort flavor, the Chocolate Raspberry. This cupcake was easily the size of two or three cupcakes combined, and a total steal at $2.99. Of course, since it was a grocery store cupcake, I proceeded with caution. While the cake had a subtle hint of raspberry flavor, the frosting completely tasted like cotton candy. There wasn’t an ounce of raspberry flavor present! I tasted it over and over again, to see if my tastes buds were off, but couldn’t get past the artificial cotton candy sweetness. For as much as I love real cotton candy, I don’t like anything that is trying to taste like it (or, in this cupcake’s case, that isn’t supposed to taste like it but still does). The cake was a little dry on the outside, but fairly moist on the inside, and after the day I had, I wasn’t going to be too picky. I finished the cake and trashed the frosting. As I mentioned above, I have often purchased questionable cupcakes in the past, each producing mixed results. 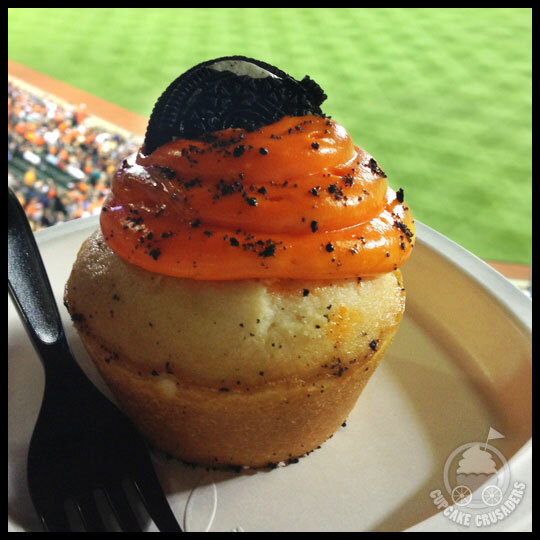 There are two times in particular that are especially memorable for me: first, an awful cupcake from Au Bon Pain in Baltimore’s Inner Harbor, and second, a sketchy looking cupcake from Target in White Marsh, MD, which ended up being okay. 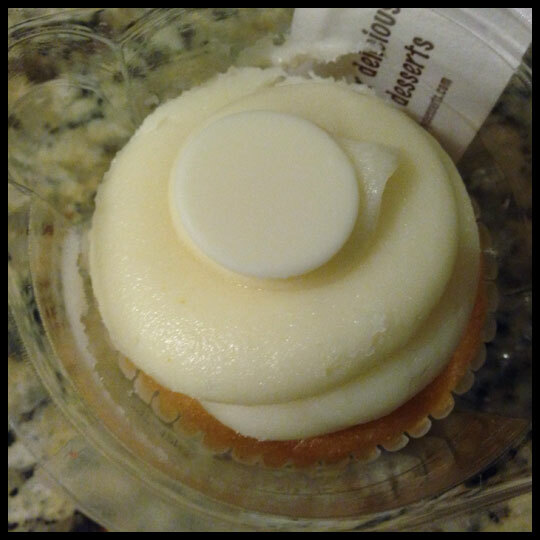 (Vanilla cupcake from Au Bon Pain). I had heard bad things about the cupcakes from Au Bon Pain, but I wanted some coffee so decided to stop in one afternoon. Of course, I couldn’t resist browsing the desserts while I was there and left with more than just an iced coffee (ignoring all advice to avoid the cupcakes). I really should have taken a closer look at the Vanilla cupcakes before spending $3 on it. The frosting looked like half melted wax, and it certainly didn’t taste any better. Even though you can see the vanilla bean specks, there wasn’t any vanilla flavor and it had a weird texture. While the cake had a decent flavor, it was completely void of any moisture, like a dried out sponge. I decided to try and microwave the cupcake to see if I could salvage the cake (the frosting was a lost cause), but that didn’t do anything to help, so into the trash it went. At least I had a tasty iced coffee to comfort me and my cupcake sadness. 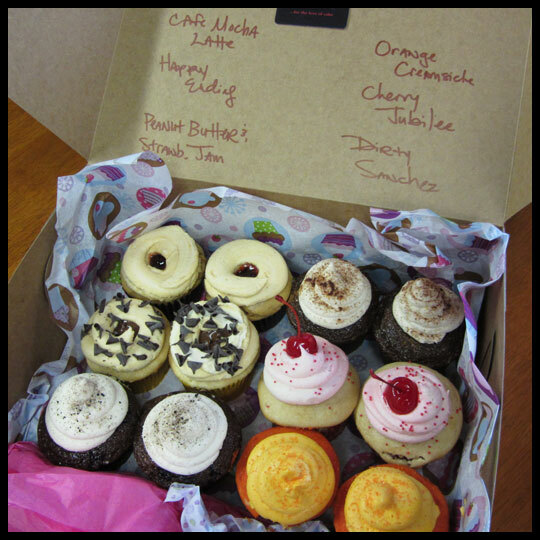 With a handful of “What was I thinking” cupcake moments under my belt, you would think that I would learn when NOT to buy a cupcake, but we’ve vowed to try them all, and it’s something we take VERY seriously (well, as serious as cupcake eating can be). 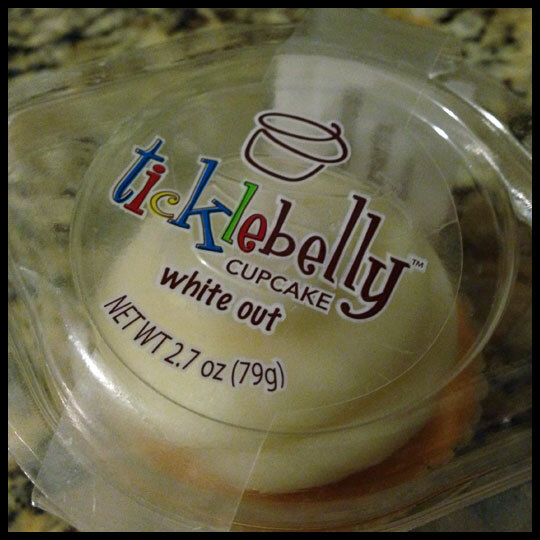 And, for as many bad experiences as I’ve had, there are also some not-so-bad ones too, like this Ticklebelly White Out cupcake from Target. I really wasn’t expecting much from this cupcake, but it came in a cute little to-go container, and since Crusader Jenn has had such great experiences with Kimberley’s Bakeshoppe (found at her local Walmart), I figured I’d give it a try. Plus, it was only $1.29. The cake was a little spongy and commercial tasting, but it was also more moist than a typical grocery store cake. The frosting was a little greasy (I think they used some kind of shortening as the base), but not overly sweet, with a nice flavor. The biggest surprise was the filling (I didn’t even know it had a filling!). It was a pastry cream that was actually pretty good. Overall, this cupcake was totally worth its low price—especially since I knew I could reuse the to-go container. 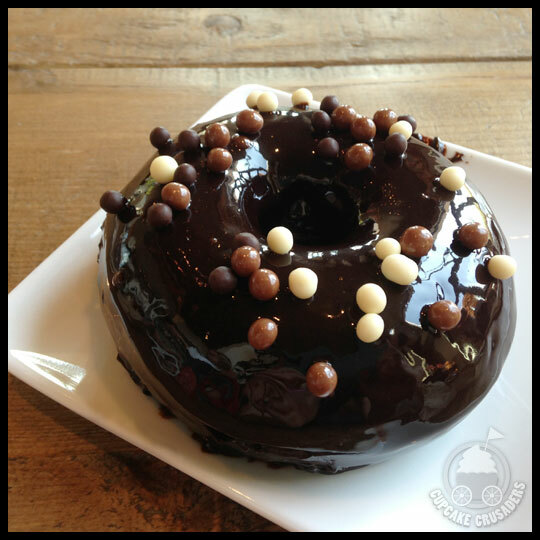 Ticklebelly also makes cake pops, molten cakes, dessert shots, and sheet cakes. I’m curious to see if Target carries any of their other products because I’ve only ever noticed the White Out cupcake and Red Velvet. 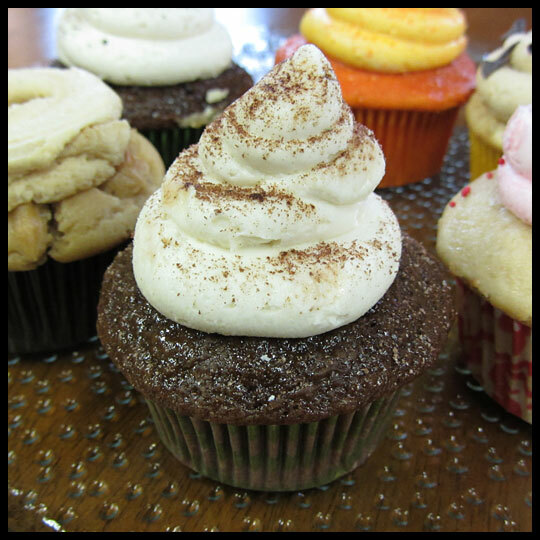 They also offer Chocolate, Key Lime, PB&J, Pumpkin (seasonal), and Snickerdoodle filled cupcakes. According to their website, you can find their products at Kroger, Ralphs, Raley’s, Fred Meyer, and King Soopers, in addition to Target. I think the most important things to remember when buying cupcakes are to keep an open mind, don’t expect too much, and always have a back up plan if you really need to feed your sweet tooth. 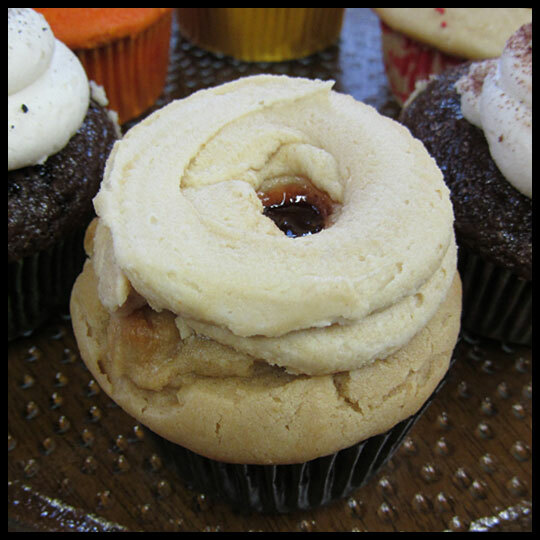 In the world of cupcakes, whether you are at a high-end pastry shop or the local grocer, some are great and some are not, so why not give them all a try? With a wall-mounted flat screen tv, a couple of high top tables with chairs, and bold black, white, and pink decor, Ooh La La Cupcakery‘s new location is certainly a big step up from their previous location in Inner Harbor (although, while that location wasn’t a full walk-in shop, they did a great job glamming it up as best they could). Their new shop on 1216 North Charles Street opened at the beginning of February, less than a block away from where my weekly grad-school class meets. Even though it’s been over two months since their opening, I wasn’t able to stop in until this past weekend. Working full time, going to school, and keeping up with this blog have put a serious limit on any free time I used to have. Thinking back, it’s been about two months since I’ve actually gone cupcaking in a full service cupcake shop (I’m not counting stops at cupcake trucks, fundraising events, etc. Of course there have been cupcakes, just no new visits to actual cupcake shops). There is something wonderful about stepping into a room filled with beautiful cupcake displays. I love the process of reading the names, asking questions, and narrowing the options down to my final selections. Obviously I like eating cupcakes, but I also really love the entire experience. However, if the service isn’t good, it can ruin that experience. On my first visit to Ooh La La in the Inner Harbor, I was helped by a young man who seemed less than eager, but this time, that same gentleman was AWESOME. He greeted me an enthusiastic “hello” and a warm smile before going over the flavors. I guess everyone has off days, and I was glad to see his happy side. 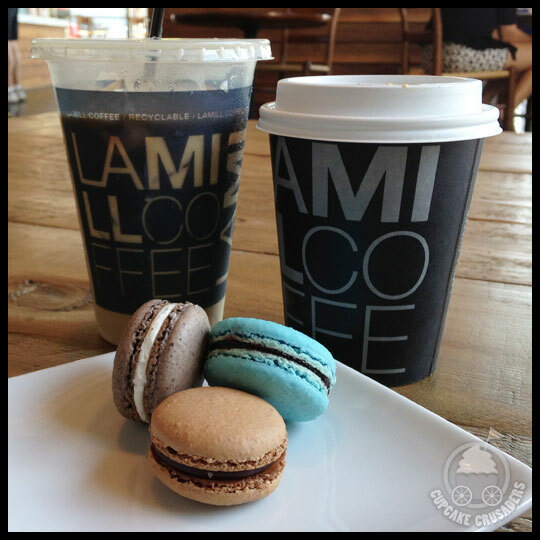 On that day Ooh La La had many refreshing warm-weather flavors and tasty looking classics available, so it wasn’t an easy choice to make. I saw the Birthday Cake cupcake and knew right away that it was going home with me (I can’t say no to anything with sprinkles). Then I decided on the Pistachio, Key Lime, and Lemon cupcakes as my remaining three. At first, I was a little disappointed that my cupcakes weren’t placed in a cupcake box (I’m always worried they will be smooshed and destroyed before I can take pictures), but the cupcakes were arranged neatly in their containers and carefully placed in a white bag with a pretty pink ribbon. They even included pink napkins and an information card on Ooh La La. And luckily their cupcakes are pretty sturdy and held up nicely on the ride home. For some reason pistachio flavored food intrigues me, but I think I’ve decided that it’s just not a flavor I enjoy. 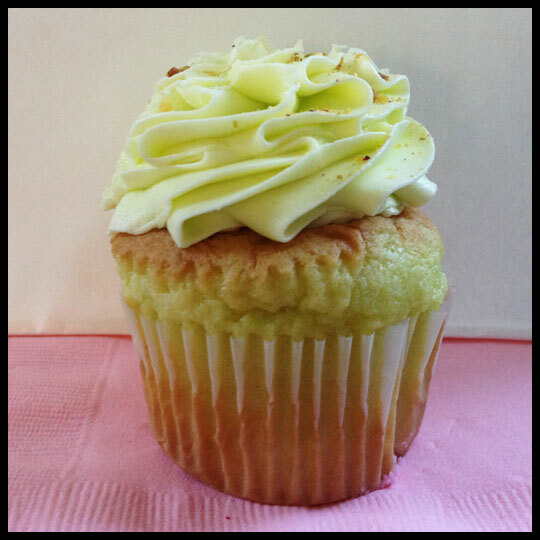 There was absolutely nothing wrong with Ooh La La’s Pistachio cupcake. The cake was moist, the pistachio flavor was present throughout the cupcake, but I didn’t dig it as much as the others. But, if you love pistachios, then you should definitely try this cupcake. The cake on this cupcake was moist and had a nice key lime flavor, but the best part was the frosting. It was perfectly tangy and sweet. I REALLY wish this cupcake had a filling. It might actually be the first Key Lime cupcake I’ve tried that didn’t, and I think that it helps make the cupcake reminiscent of a Key Lime pie. Still, it was a tasty cupcake. This cupcake was so good and exactly what I look for in a Lemon cupcake. 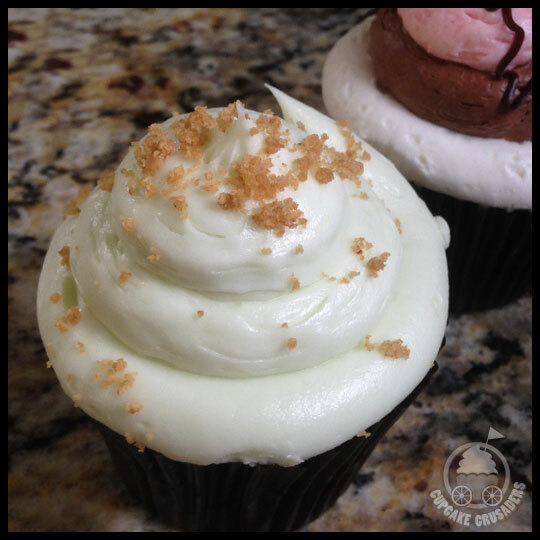 Similar to the Key Lime cupcake, it was the perfect blend of tangy and sweet. This was easily my favorite of the four. There is really not much else to say other than: YUM. Sprinkles! As I mention above, the second I saw how jam-packed this cupcake was with sprinkles, I knew it was going to be all mine. 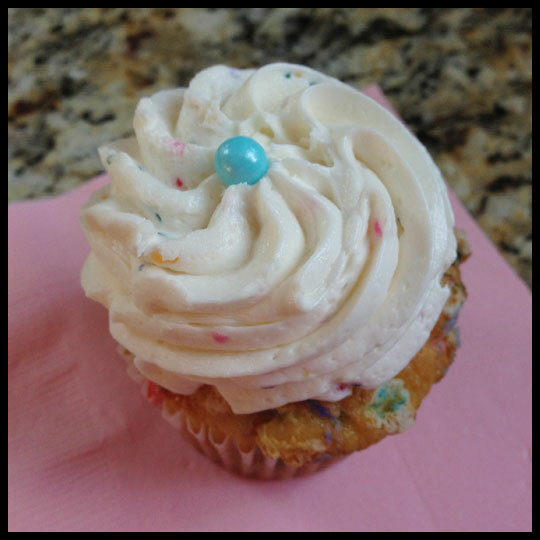 Funfetti is one of my favorites, and this cupcake was like Funfetti taken to the next level. It even tasted almost like a spoonful of sprinkles! Which is a good thing—at least in my book. This cupcake was sweet, fun, and totally put a smile on my face. 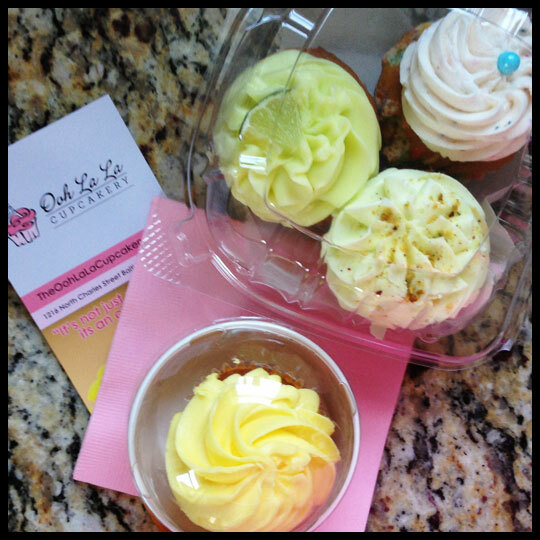 Other than the fabulous new location and storefront, I really enjoyed how the cake AND frosting were flavored in all the cupcakes I purchased. 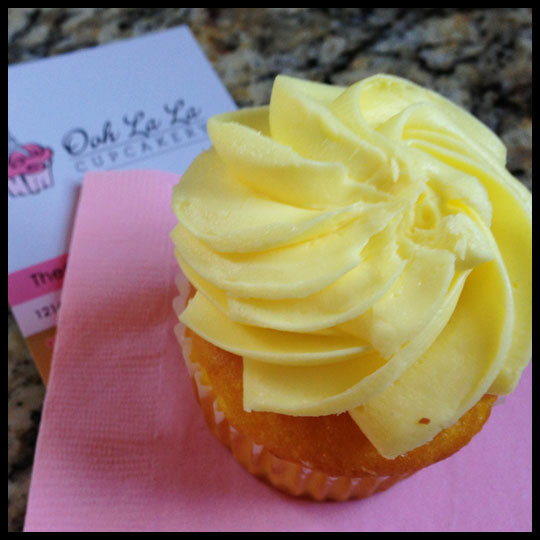 More often than not, cupcake shops will use a basic yellow or chocolate cake as a base and then just flavor the frosting to create a variety, but not Ooh La La. 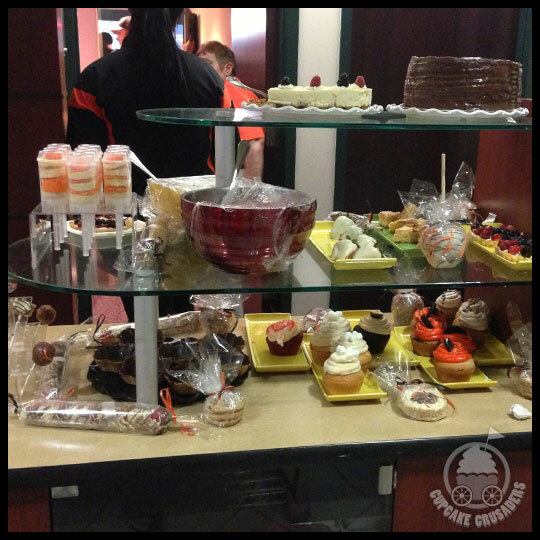 They also offer chocolate covered strawberries, chocolate dipped pretzels, candy covered apples, and ice cream. Their website is currently under construction, but they have been very active on their Facebook page, where you can follow them to stay updated on new flavors and specials.